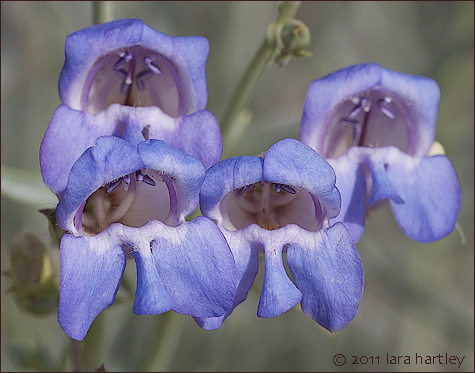 Description: Mojave beardtongue is a rounded, branching, erect shrub reaching one meter in maximum height. The glandular inflorescence produces several wide-mouthed tubular or funnel-shaped flowers measuring 2 to 3 cm long. The flowers are blue-purple, glandular on the outer surface and mostly hairless inside except for the hairy sterile stamen. Leaf: The thick leaves are linear to lance-shaped with rolled, untoothed edges and reaching up to 7 centimeters. Notes: Penstemon incertus, a dicot, is a shrub that is native to California and is endemic (limited) to California alone. This photo was taken on May 8, 2004 in the Mary Dedecker Native Plant Garden at the Inyo County Museum, Independence, California.